The DPF940000 series has been discontinued. Please see the DPF9300 as a possible alternative or contact our sales department. The DPF940000 Series counters are available as a standard counter or a batch counter. The standard counter is available with single or dual presets. The batch counter has a main process counter with dual presets and a secondary counter with a single preset. The secondary counter can be selected to function as a batch or a total counter. 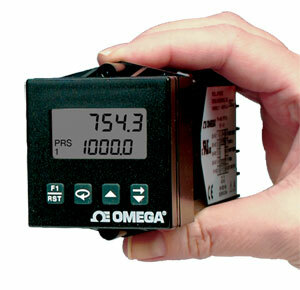 They feature a 7-segment, 2-line by 6-digit reflective or backlit LCD display. For the backlit versions, the main display line is red and shows the count value or the batch/total value when preset 3 or output 3 is viewed in the secondary display. The smaller secondary display line is green and can be used to view the prescaler value, preset values, output time values or batch/total count values (batch model). The DPF940000 series offers a choice of nine programmable counting modes for use in applications requiring bi-directional, anticoincidence, and quadrature counting. The unit may be programmed to register counts on both edges of the input signal providing frequency doubling capability. DIP switches are used for input configuration set-up and to provide a program disable function. Four front panel push-buttons are used for programming the operating modes and data values, changing the viewed display, and performing user programmable functions, e.g. reset, etc. They can be configured for digit entry or automatic scrolling. The program disable DIP switch, a user-programmable code value, and an external user input selected for program disable can be utilized to provide multi-level protection against unauthorized changes to data values and unit configuration. The counter has programmable User Inputs and a programmable front panel function key. The user inputs can be configured as sinking (active low) or sourcing (active high) inputs via a single plug jumper. The user inputs and the front panel function key can be configured to provide a variety of functions. The optional RS-485 serial communication interface provides two-way communication between a DPF940000 and other compatible equipment such as a printer, PLC, HMI, or a host computer. In multipoint applications (up to thirty two), the address number of each unit on the line can be programmed from 0 to 99. Data from the DPF940000 can be interrogated or changed, and alarm output(s) may be reset by sending the proper command code via serial communications. The unit is constructed of a lightweight, high impact plastic case with a textured front panel and a clear display window. The front panel meets NEMA 4X (IP65) specifications when properly installed. Multiple units can be stacked horizontally or vertically. Modern surface-mount technology, extensive testing, plus high immunity to noise interference makes the DPF940000 counters extremely reliable in industrial environments. Note: The +10% tolerance range on AC input voltage must be strictly adhered to. DO NOT EXCEED 26.4 Vac. DC Out (Terminal 10): For units which do not have PNP current sourcing outputs, this terminal provides a DC output for sensor power (12 Vdc ±15%). The maximum sensor current is 100 mA. For units with PNP current sourcing outputs,this terminal serves a dual purpose depending on the applications PNP output voltage level and current requirements. If a higher PNP output voltage level or additional output sourcing current is desired, an external DC supply may be connected. This supply will determine the PNP output voltage level, and must be in the range of 13 to 30 Vdc. The maximum current rating of 100 mA per individual output must not be exceeded, regardless of external supply capacity. Note: Comes with operator's manual.